A busy schedule as music director of the Bach Collegium Japan and sought-after guest conductor doesn’t stop Masaaki Suzuki from returning to his first loves, the organ and the harpsichord. 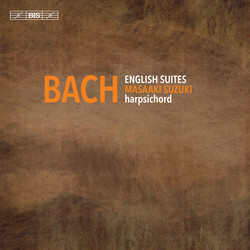 With the present release he adds yet another chapter to his series of Bach’s works for solo harpsichord. After acclaimed recordings of the Well-tempered Clavier, the Goldberg variations, the French Suites and other works the turn has come to the English Suites. Composed while Bach were in his thirties it precedes other sets such as the French Suites and the Toccatas, and in his liner notes, Bach scholar Yo Tomita draws attention to 'the stylistic traits of a youthful and ambitious composer wanting to make his mark through the use of counterpoint and virtuosity'. Despite its title, the collection has very little to do with England, at least musically: the six suites are instead rooted in the French tradition, and show certain striking similarities to the composer Charles Dieupart’s Six Suittes pour le Clavessin from 1701. (Bach made a copy of Dieupart's set sometime between 1709 and 1716.) It was only in the 19th century that the suites became known as the 'English', based on a never substantiated claim that the set was commissioned by an English nobleman.